COX'S BAZAR, Bangladesh, May 15 2018 - Almost 12,000 Rohingya refugees have now been moved to safer ground by IOM, the UN Migration Agency, as storms continue to lash southern Bangladesh, damaging tarpaulin shelters and raising the risk of landslides on the steep sandy slopes of the refugee settlements. IOM is racing to support the ongoing relocation of 24,000 people recognized as being highest risk. The inter-agency Site Maintenance Engineering Project (SMEP) – a joint effort between IOM, WFP and UNHCR – is also working at full speed to prepare new land made available by the government to the southwest of the existing camps to allow more people to move to safer ground. Almost 700,000 refugees have fled violence in Myanmar and arrived in Cox’s Bazar since August 2017. The initial influx saw hundreds of thousands of people desperate to find a place to shelter. As a result, many ended up living in drastically over-crowded conditions, on dangerous, unstable slopes stripped of vegetation and at risk of collapse in the rain. As of this week, IOM, with support from partners, has helped 11,791 people to relocate – either because they were at serious risk of landslides and floods – or to allow for emergency access and other crucial infrastructure to be installed ahead of monsoon. Around 3,000 more people have been relocated by other agencies for similar reasons. The latest relocation numbers came as early incident reports revealed that lightning storms and strong winds, which have hit the refugee camps over the past few days, damaged scores of shelters and caused several small landslides, creating even more precarious living conditions for some refugees. IOM engineers working under the SMEP say that the first section of a new site to the southwest of the current camps is now ready to receive shelters and other key services, including water, hygiene and education facilities. The newly prepared land is part of around 40 acres that will be prepared in the coming weeks to accommodate hundreds of families most at risk from floods and landslides. 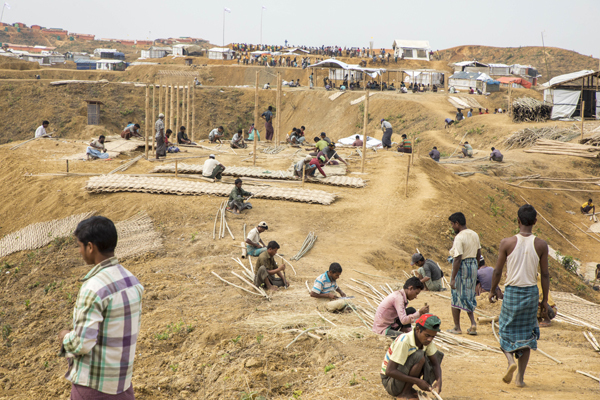 The government of Bangladesh has made 500 acres of new land available to relocate refugees at risk, but due to the topography of the Cox’s Bazar area, where much of the land is hilly, major earthworks are needed to prepare the ground. Only a fraction of the newly available land can be made safe for relocation before the monsoon, which will begin in earnest next month. Pereira added that relocation is one of a range of measures being taken by IOM and its partners to support the refugees in the months to come. Others include pre-positioning of key road clearing equipment and emergency provisions, mobile medical services, training refugees in search and rescue and first aid, and raising people’s awareness of the risks. “We recognize the dangers that everyone in the camps will face when the worst weather arrives. That’s why we are also preparing emergency response measures and supporting the refugees so they can work to strengthen their shelters and have the skills needed to respond to disaster situations,” he added. As Bangladesh’s annual wet season approaches, IOM is also working to secure infrastructure and strengthen preparedness measures. •	34,123 families have received Upgrade Shelter Kits. •	40,000 households have received community training on shelter upgrade and disaster risk reduction. •	9,600 refugees have provided feedback that is being analyzed to prepare PSA messages for the monsoon season. •	30 field staff have been trained on cyclone season message delivery. •	650 refugees and local community members are being trained in first aid, search & rescue and fire safety via partnerships with the Bangladeshi Fire Service & Civil Defence, American Red Cross and Cyclone Preparedness Programme. •	5 mobile medical teams are being trained to provide primary lifesaving health care services to displaced people. •	20,000 acute watery diarrhea kits, 73 million aquatabs and 360,000 hygiene top up kits are prepositioned and being distributed through water, sanitation & hygiene (WASH) agencies.